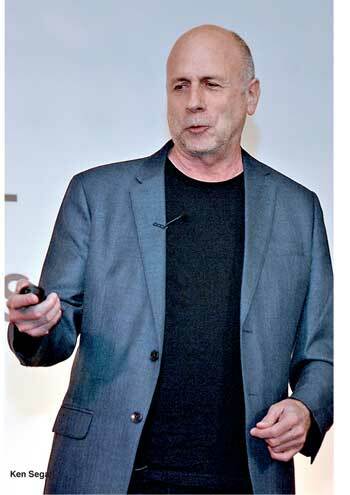 Ken Segall, one of the key creative consultants who worked with Steve Jobs on Apple’s iconic ‘Think Different’ campaign was here in Sri Lanka for a series of events, organised by the Sri Lanka Association of Software and Service Companies (SLASSCOM). Segall played a great part in Apple’s journey towards b eing a multi-million dollar brand. Apart from being a team member in the ‘Think Different’ campaign, Segall was also involved in naming the 1998 desktop version of Apple Mackintosh as ‘iMac’. He is also the author of ‘Insanely Simple: The Obsession That Drives Apple’s Success’ which talks on how simplicity became Apple’s monistic philosophy towards success. Ken Segall addressed local professionals from design, advertising, branding, marketing and IT industries at the Sri Lanka Exhibition and Convention Centre where he shared his experiences with the attendees. He spoke about his time with Steve Jobs and Apple and how Apple embraced simplicity. “As an advertising person, I have worked with different companies in that capacity. Many of them are in the area of technology. Working with these companies helped me to absorb higher principles of simplicity that are worthy of picking apart and applying them in different industries. A complicated company can become simpler by following different modes of simplicity,” said Segall. Segall was well-equipped to explain Apple’s inner workings, having spent 12 years working closely with Steve Jobs both at Apple and at NeXT. He said that he got to see the Steve who was not successful and the Steve who was super successful. “I worked with Steve for directly 12 years and I am proud to say that over the 12 years; he only beat me up twice. If you annualise that, it is less than one per year. I lived to tell the tale to you,” Segall joked. Apart from his relationship with Apple, Segall has also worked with companies like Intel, Dell, IBM and BMW. “I wrote my book about simplicity largely because of the experiences I had with these complicated companies. I knew that Apple was simple and I didn’t realise what other companies were like until I started hanging out with them. We worked for many hours, spent more money and tested ourselves to death and what we ended up with these companies was something less quality than we did at Apple. At Apple, our outputs were fast and we did something really creative. That actually got me thinking about writing this book,” he said. When Steve joined Apple again in 1997, the company was on the verge of going bankrupt. Even the famous tech magazine Wired did a cover which had the Apple logo entangled in a barbed wire with the caption ‘Pray’. However, Steve did a revolution of his own and made Apple the most valuable company on earth in just 14 years. Segall said Steve’s dedication and devotion towards bringing simplicity to Apple changed the game, which was a remarkable effort. “The world is a complicated place. When you do something simple, it stands out. It is just a fact of play. And when you do advertising; that is the way you normally approach because you know that your advertising is going to be in a much cluttered environment; billboards, press ads, TV commercials, magazines and so forth. When you do something simpler, it really does stand out. It has to be good of course but simplicity should be an important part of it,” said Segall. Steve returned to Apple back in 1997. According to Segall, the whole world kept their focus intact with Steve on what he was going to do. Steve wanted the creative team from TBWA\Chiat\Day, to create a campaign that would tell the world Apple is alive and well. “We weren’t supposed to talk about computers so there were no computers in the advertising. This was a brand campaign and the idea was to tell people that Apple was alive and well. With Steve’s return, more attention was focused on Apple and Steve wanted to convey that Apple’s spirit of creativity was still intact to the world and Apple’s employees,” said Segal. The campaign was about great people who changed the world in major ways and pushed the world forward. Segall told that the team behind this campaign worked very closely with Jobs and he really loved the meaning of this entire campaign. The voice over for the commercial was also done by Steve Jobs. “Think different; these two words really captured the essence of the company and it is not something very easy to do. Steve had this thing about advertising where he hated advertising. I am with him in that point. When something sounds like an ad, you feel like you are trying to fool someone into something. Steve wanted something authentic and ‘‘Think Different’ had that authenticity. These words were very meaningful for Apple; all the way back to the beginning of the company in Steve’s dad’s garage. ‘Think Different’ is just as valid today if they were still using them for Apple Watch or iPad,” Segall told the audience. Ken Segall enlightened the audience on how he named the 1998 Apple Mackintosh G3 as ‘iMac’. It was the first computer designed to access the internet easily and it was indeed the revolution which desktop PC users were looking for, Segall said. He recalled some good memories happened during the naming phase. “I created five names where I kept iMac as the last one because I thought it would be the clear winner. It was so simple and subtle. Steve hated the first four and he hated iMac as well. I didn’t give up though because we truly believed in iMac. Steve gave another week to work on. I gave three brand new names which he disliked. I pulled up the iMac again but this time Steve said, ‘I don’t hate it this week but I still don’t like it’,” Segall said. However, Segall said they were able to convince Jobs to use ‘iMac’ and he joked that it was a historic moment of convincing to use ‘iMac’ rather than ‘MacMan’. “It was kind of a non-ending and we had no moment of glory or an e-mail of appreciation. It was great to think that Steve believed in that. I believe he liked the small ‘i’ and big ‘M’ and it was very short. He had that thing about simplicity. We had the perseverance and we believed our idea and brought it back. Anyway, we saved the world from having the ‘PhoneMan’ or ‘PodMan’ and all of the things that might have come after that,” said Segall. Ken Segall talked about five points which emphasised simplicity and its power for any kind of business. The five points were love, doing fewer things better, common sense, how words matter and minimisation. He said that people loved Apple for their simplicity and kept buying more products. Many of them even evangelised Apple products to the friends, family and colleagues and encouraged them to buy Apple products. He also said when something bad occurred, Apple was insulated. He recalled that when iPhone 4 was released, people had complained about its antenna which ran around its edges and negative stories about iPhone 4 and Apple surfaced within 24 hours. However, Jobs managed to diminish those critics within 24 hours by calling a press conference and explaining the public why Apple tried that strategy. “In every presentation, Steve had a thought that he wanted to convey and he would beat it to death. But, he would do it in a very Steve-like way and he had that easy-to-believe personality within him. In that way, Apple was always insulated and people believed in what they did,” said Segall. Doing fewer things better was a huge thing for Apple, opined Segall. He quoted one of Steve’s famous quotes, innovation is saying no to a thousand things, and said that Apple always believed in peeling the many layers and creating something pure and very simple. When Steve came back in 1997, Apple was making over 20 distinct products. They had printers, cameras, scanners and all kinds of things. They were trying to enter the computer world but many of the products were mediocre. When Steve introduced the iMac, he said that he was going to kill the entire Apple product line except for two products; the PowerMac and the PowerBook laptop. This announcement enabled Apple to stop the flow of a ridiculous amount which was spent on 20 products. Segall spoke about the importance of common sense and said that it was one of Steve Job’s stringent points. He applied common sense to the entire development process of Apple and he used to put people down when they didn’t use their common sense, Segall said. “Steve was different from other tech industry leaders. He really dealt with the consumer and all was about user experience. He would never have thought about using a system like Microsoft,” said Segall. Segall showcased one of Apple’s early adverts which read ‘simplicity is the ultimate sophistication’. A simplicity critic would say that simplicity is the dummying down of the information or product so that everyone can use it but that was not the case at all, Segall said. Minimisation is the most important element of simplification, Segall said to the audience. It is the act of taking something and making it a less of a thing for refining purpose. Segall took out of the example of Apple University which Steve Jobs started a couple of years before his death. He said the idea was to train the incoming executives of the principles which made Apple a globally-recognised brand. Being simple is not simple, Segall said. It requires an incredible effort and Segall opined that Steve Jobs was very successful in bringing simplicity to Apple and he wanted all his employees to practice it hard so that simplicity would become Apple’s ultimate competitive weapon. “Steve always used to say that simple could be harder than complex. You have to work hard to get your thinking clean to make it simple. It is worth it in the end because once you get there, you can move mountains. Simplicity was Steve’s philosophy that led Apple from near-bankruptcy to the most valuable company in the world,” Segall said in a concluding note.